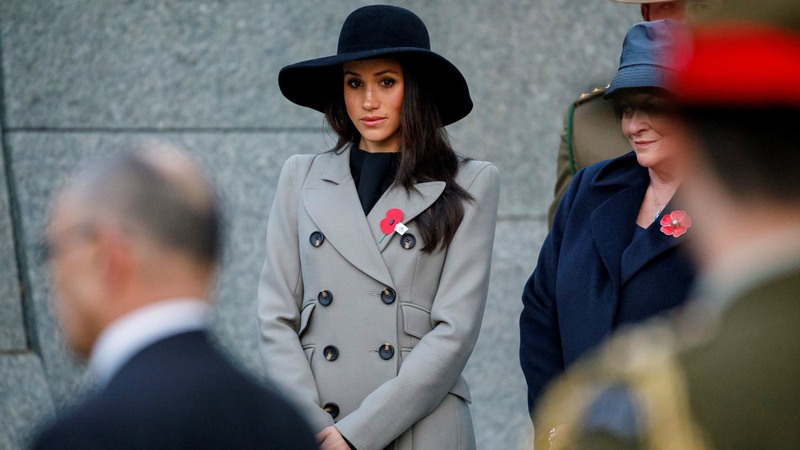 Did Meghan Markle’s Dad Fake Photos Ahead of the Royal Wedding to Make Money? Ugh, say it isn’t so! One week shy of Meghan Markle’s royal nuptials to Prince Harry, the bride’s dad has been accused of staging “wedding prep” photos in order to make money. Poor Meghan can’t catch a break where family drama is concerned, and this is the latest in a long line of sordid attempts by distant relatives to cash in on her happiness. It all started with a string of seemingly innocuous — and kind of adorable, in a proud dad way — photographs showing Thomas Markle gearing up for his daughter’s big day: from getting measured for his suit to studying up on her new country by poring over a book titled Images of Britain. However, photo editors suspected foul play and reportedly have gotten their confirmation. Per the UK’s Daily Mail on Sunday, CCTV footage proves Thomas staged and posed for these photographs to sell to newspapers around the world. In the footage, Thomas is seen meeting with photographer Jeff Rayner and preparing for the photos, which would ultimately be passed off as candid shots. Images obtained by the Daily Mail show the pair meeting on March 27 at an internet cafe in Rosarito, Mexico, where Thomas reportedly lives. More: Is Prince Harry Signing a Prenup Before Marrying Meghan Markle? “The man and the photographer came in together. It was in the morning. They didn’t stay long, probably about 10 minutes, and they left together. I thought it was strange that they were taking pictures in here. It’s an unusual place to take pictures,” Jessica Anaya, the cafe’s manager, told the Daily Mail. In one of the more widely publicized photos, Thomas can be seen being measured by a “tailor” for the suit he would presumably wear to walk his daughter down the aisle. However, the Daily Mail alleges that the tailor is actually David Flores, a 17-year-old student who works part-time in a party supply rental shop. Flores stated that Thomas and Rayner showed up with their own tape measure, asked him to take Thomas’ measurements and then tipped him about $15 for his help. Adding insult to injury? Mere hours before Thomas was exposed for the secret collusion, his own representatives reached out to media organizations globally to stress to editors that he was “suffering” from the media’s intrusion into his life. Kensington Palace officials also reached out on Thomas’ behalf, expressing frustration over how Meghan’s father had been “followed and harassed” by paparazzi and asking for it to stop. All told, Thomas reportedly stands to gain upwards of $150,000 for the photos that have been published so far. However, it’s also possible Thomas participated in the photo shoots in a misguided attempt to get paparazzi off his back by beating them to the punch. According to the Daily Beast, Kensington Palace did not respond to a request for comment. The outlet did say, though, that it would appear Thomas will still walk Meghan down the aisle.